The press release announcing Accenture's new "Consumer Survey: The Evolving Consumer and The Pharmaceutical Company Relationship" claims that the survey "suggests pharmaceutical companies are falling short in addressing this captive audience" (my emphasis; find the press release here). It's unfortunate that the press release uses "captive audience" to describe consumers who go online for health information. To a marketer, a captive audience is a technical term (jargon) that merely means "people who cannot avoid being exposed to an advertisement." The top line takeaway from the press release is that only "slightly more than one in 10 (11 percent) [of consumers who go online for health information] regularly turn to a pharmaceutical company’s website to seek information about an illness or medical condition, compared to nine in 10 (92 percent) who look to other online resources more frequently." The press release then goes on to say that "pharmaceutical companies that are not fully leveraging multiple online channels are missing a real opportunity to address this captive audience. It also demonstrates that the fundamental shift from a predominantly one-way company-to-patient dialogue to enabling a patient-to-patient – and even a patient-to-physician dialogue – through the evolution of social networks and online communities, has resulted in fragmentation." From this, you -- and probably many reporters as well -- might conclude that the answer to my question is that consumers are not going to pharmaceutical company web sites so much and that the drug industry better engage in conversation with consumers on social networks and patient communities. In other words, consumers are NOT flocking to Facebook to find health information. So, why are pharmaceutical companies so interested in having Facebook pages, which, BTW, often do NOT allow comments? Simple. Facebook has surpassed Google in terms of Web site traffic ("eyeballs") and pharma marketers are still seeking this "captive audience" to display ads (ie, Facebook pages), not to engage in conversation (for more on this, see "Drug Companies Are Flocking to Facebook for Eyeballs, Not Conversation"). I had the same question a week ago:since many of the online communities are not web-based and are located behind strong privacy firewalls how can statistics abou their use be accurate? I believe usage is strongly underreported, but I am biased too. I have new data from a Sept 2010 survey which expanded our series on social network site use. First of all, many more people are using those sites - 62% of internet users have a profile on FB, MySpace, or LinkedIn. But the % who get health info on those sites has not increased. I won't give away any more (the report will come out in December) but this new data you cite is on target. This data is so skewed that it is amazing that any pharma marketer would buy into it. When I sit down and surf the Web do I go to Ford.com ? The answer to that would be NO unless I am looking to buy a new car and Ford is one of my options. If I have a problem with recurring headaches am I going to go to Celebrex.com or go to Web MD ? You're going to go to Web MD of course. Over the 10+ years of analyzing med device, pharma and biotech sites I have found that the top pages usually revolve around the medication, especially the safety info and side effects. In addition click stream analysis usually shows that people come to my product.com after or before going to a competitors site. Thus they are at the stage of their health search when they are comparing health treatments or have an Rx from their HCP. There is no doubt that pharma product websites need to evolve and get better with things like customized landing pages and medical information that people can actually understand coupled with deep links to credible health information. All Accenture is trying to do here is generate "buzz" around their press release in hopes that someone in pharma is dumb enough to believe this garbage. For me I prefer Manhattan Research and eMarketer for sources of health information patients and where they go and what they do. Great analysis. We're working on a report on a study we conducted recently (for the Path of the Blue Eye Project) on why people aren't sharing health information via Facebook. We found that privacy concerns were a major reason people don't share. More to come on that study, slated for a December release. Great points by Susannah. Question: I categorize Patients Like Me as an "social media" patient community platform (just like Facebook is a platform). Platform: area for communities to live, breathe, share and converse. Not sure facebook fits under "social media" as its' currently mapped in that infographic-- whereas perhaps this grid would better represented by: "what social media platforms patients are on--- and what platforms they are using to look for/consume health-realted info?" I think those stats would serve greater clarification for the target audience info consumption. Whether those stats exists of not----? Perhaps that's a whole nother story. I put patientslikeme in the online patient community category.Accenture did not offer specific examples in the data summary I received, although they did mention facebook and Twitter as examples of social media sites. A couple of thoughts. Is WebMD the site visited at the time of first diagnosis? Do patients return there frequently to continue learning? Do they visit other sites for more in depth knowledge? What is the behavior post WebMD? Has anyone measured what behavior changes or knowledge change occurred post a site visit? Are these visits for chronic diseases or are they for Otitis media? I worry that this type of data taken too seriously misses the need to identify learning behavior and outcomes and how to address patient needs for knowledge. Facebook may well be places a small number of patients visit who have chronic illnesses and therefore have a larger HC footprint. I hear ya- it defined by the info in the release. Maybe the PEW December report will offer more granularity on this subject. I agree with Mark also-- re: understanding behavioral patterns. 1st, 2nd 3rd 4th tabs open in Firefox...what's the decision making process and flow for information seeking followed by subsequent consumption. That will definitely be the magic ticket for informing communication strategies. Inherent in much consumer health information search is a need, actually or potentially, to DO something - specifically, to do a thing or things new or unfamiliar to the person looking, to someone they are helping, or both. Implicit in that information quest is the looming possibility of important, inevitable, and imminent behavior change - change few anticipate with unbound relish. Such change almost always has more to do with non-clinical than clinical aspects of whatever health condition generated all of the information-seeking activity. Daily schedules, "maps" of daily movement, diets, social interactions, budgets - all are, or may be, put into play. Online health resources that do not address one or more of these realities will not likely be all that popular. Gee - that means most purported health resources available today, doesn't it? Very few people seeking health information are looking to "leverage channels", to "engage communities", or even to "research medicines" - they're looking to DO something, something frequently unfamiliar, and unsettling. Help them do all or even part of that something, in ways they are or can quickly become comfortable with, and you'll win. Pretty simple. This has essentially been said already, but I think the study mixes apples and oranges. 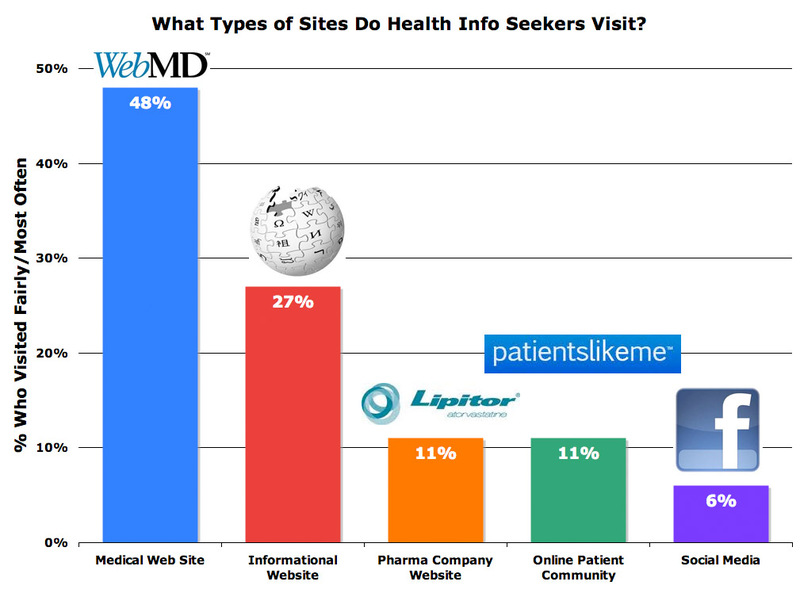 If we want health information, we go to health or information sites. Pharma web sites are product sites geared toward the buyers/prescribers. As was mentioned earlier, if I want to buy a car, the last site I would visit is the site of the car maker. I would perhaps visit the car maker site once I've made the decision to buy their car, or perhaps when I'm trying to decide between two makes or models. It's the same here. There is no point in my going to Lipitor's web site unless my doctor has prescribed Lipitor, but even then the site is not helpful because it'snot geared towards me anyway, so why bother? Now the Wikipedia data are interesting in that visitors are assuming that information is factually correct. Is it? How much trust can we put into a site like that for medical and other technical/medical information? Going to WebMD makes a lot more sense from a patient perspective. What you are citing is anecdotal evidence, which is even less reliable than this survey data. It would be interesting to "follow" patients for a whole day while online and see exactly what sites they visit and for how long. I wonder if this has ever been done? John: I think that is a great idea to follow a patient for a day. I would like to see a small study done looking at this issue from a learning perspective. We know that adults will on seek learning to solve problems they are having. If we begin with that premise we can design a study to identify different problems and how learners solve HC problems. From the studies I have seen there is not a huge effort to dive deep into behavior and learning in HC. I would love to find a company really interested in understanding this issue. i believe that the depth of some survey analyses are not deep enough, especially many of the q&d consulting company ones. One should observe or ask within three major obseravtion categories: 1. informational behaviour (what they seek), 2. communicational behaviour (asking, answering, exchanging among others) and 3. participatory behaviour (voting, entering data and similar). If you combine these three categories with e.g. e-patient typologies (e.g. chronics, caregiver), you get a brighter picture i assume.